If so, you are practicing one of the cornerstones of Acceptance and Commitment Therapy developed by Dr. Stephen Hayes. Acceptance and Commitment Therapy, known as ACT, combines CBT principles with mindfulness techniques. In a process called Cognitive Fusion, your unhealthy thoughts are seen as being fused to your mind and those automatic thoughts distort your perceptions. Only by defusing from your mind those automatic negative thoughts can help you be more objective and see things more accurately. Cognitive Defusion is an example of mindfulness techniques, which have become increasingly important in treating persistent negative thinking that leads to depression and anxiety. 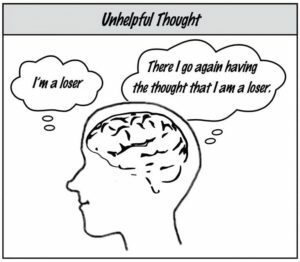 For example, your observing head can replace thoughts such as “I am a loser” to the thought that “I am having the thought that I am a loser.” This type of thinking helps us be more objective and identify less with the disturbing thoughts from our skewed perceptions. We observe ourselves thinking a certain way rather than just plain thinking that way. We mentally note our toxic thoughts rather than embrace them as true. Your Observing Self can be likened to the sky, with your thoughts and feelings being like the weather. No matter how turbulent are the hurricanes, blizzards and rainstorms, blue skies and balmy breezes will replace the turbulent weather if you are patient and have faith that the storm will pass. We don’t try to change the weather, we can not control it – rather, we can observe it and be detached from it, knowing the storm will pass and there will again be sunny days and calm breezes again. Likewise, your disturbing thoughts will also pass and by not reacting to the storm, you will develop equanimity and patience. So, try to imagine yourself watching your thoughts and upset emotions like watching the stormy skies from a window, and know at some point the skies will clear and the sun will return. When your Observing Self defuses upsetting thoughts by making them more objective outside of your head, you will give less power to the storms in your life. Another related cognitive defusion practice is to imagine putting your unwanted thoughts on a cloud, watching them disappear with your Observing Self. Do not try to alter the pace they float by and do not let those thoughts take you away from your mindful present moments. Just observe those clouds with unwanted thoughts on them with non-judgmental awareness. Mindfulness skill practice with worksheets such as My Observing Head offers practical “hands on” techniques to stay in the moment, detach from inner turmoil, and take charge of toxic thinking habits for a happier, more self-empowered life.